Most of the forums and listservs I check have gone very quiet beginning early December. It's remarkable how much the season and end of year affect people. The set is quite expensive, as the wooden track is very substantial and well-made. I won all three races I was in, so naturally I liked it! I watched a game of Citadels, a clever card game. It probably has a slightly stronger connection to reality than most "Euro" games, but the result is the same--you admire the cleverness of the mechanics rather than the cleverness of the depiction of reality (which is what you get in historical games). Another game of Seas of Gold was played as well. The near-simultaneous rules worked well, the economic tweaks worked well, the game is nearly finished (but I've said that before). While Brit 2 is being sold in Finland and Germany, I'm told by FantasyFlight that there is a problem with the plastic trays produced for the game, and it will not be issued from FFG until this is rectified, at the end of January 2006. I am having a good time with the "one hour wargame", which is working out pretty well as a new "system" related to Seas of Gold (TM) but still rather different from it. My first taks next Tuesday (start of Christmas break) is to play Caledonia(TM) and try to sort it out. I hear of one person who has bought Britannia Second Edition in . . . Finland! It is also supposed to be in stock at German retailers. Having had time to think about it, I suppose that the reason the game is first available in Finland and Germany is that it was shipped from East Asia, past India into the Red Sea, then the Med and perhaps Black Sea, to be trucked through eastern Europe (hence France and UK should have it in a few days). Minneapolis to distributors to retailers in this country, another long trip. At least many people will be able to have it for Christmas, if they wish. I've played the "one hour wargame" (Eurowargame) three times and am pretty pleased so far. You don't have to be warlike to do well, but it probably helps. The listservs and design boards seem to go dead at this time of year. I have finally played the "one hour wargame", four players, worked pretty well but needs the Event Cards (which I didn't use). In some ways the game resembles a very-much-modernized version of Diplomacy, in other ways not (obviously, if it's intended to last just an hour). The diplomatic system may be too rigid, that is, once a war starts, it may tend to lock in. Scoring systme works well, but I've revised the Progress/Culture/Well-being to require supplies. Anyway, I'm ready for another go with the revisions, but with work things hanging over my head, I don't know when that will be. I have been taking some notes about "one hour" with the idea that I'd use them to illustrate the development of a game in a design book. Of course, the "one hour" idea goes back to Germania(TM) and through Seas of Gold(TM), and there are resmblances between SoG and this new one. After reading Warriors of the Steppe, I was inspired to complete the Central Asia map. 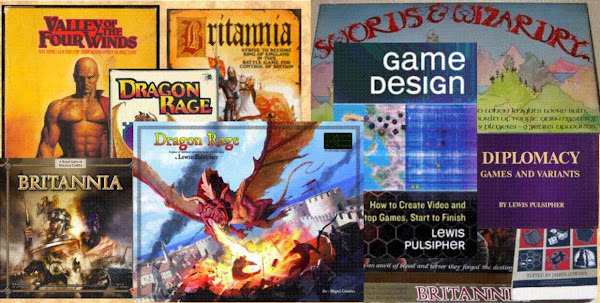 I seem to be sending a fair number of things to Boardgamedesign, boardgamegeek, and BGDF, connected with the possible game design book. But this kind of thing can always soak up time without much result; I need to write some proposals. One Caledonia PBEM test has finished. Not much testing otherwise. How to reduce "analysis paralysis? Even games with fairly simple rules (chess) can profitably be analyzed for long periods. I'm not sure what you can do about this, nor am I certain that you need to--"analysis paralysis" is practically a personality trait that tends to show up regardless of the game, unless it is dominated by chance. I've posted "one page What's important when designing a game" several places, have to put it on my Web site. I put a feedback survey address in there, and have had virtually no responses, which I suppose might mean few people are reading the magazine. At this point, *shrug*. I'm reading "Warriors of the Steppe", for Barbaria(TM), the Central Asia game, maybe others such as Europa(TM).